© 2018 SuZan Alexander, Pretty Pink Peonies, Digital Photography. Pretty. Pink. Peonies… they were a complete and total splurge. The clerk at the floral center asked me if I knew the price was per stem. I assured her that I was making this purchase fully aware of the extravagance. I am so in love with peonies. I would have purchased these beauties by the dozens if I had the budget. Not only are they a beautiful, showy display of color and fragrance, but they greet you each morning … dare I say, miraculously? It is almost like watching them bloom in slow motion. They transform from tiny ping pong ball size buds to these huge show-stopping beauties emitting luscious fragrance. Okay, so I got a little carried away with taking photos of them. I can’t select just one, so I am subjecting you to a collage of images. 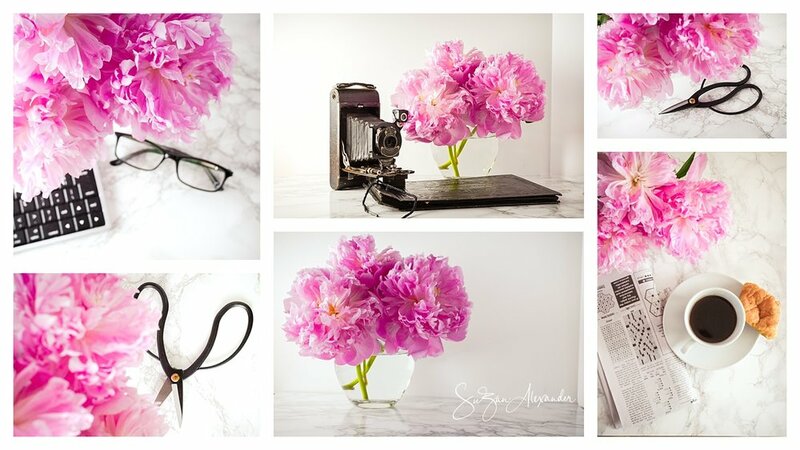 © 2018 SuZan Alexander, Pink Peonies Collage, Digital Photography. [Insert SIGH!] It seems like an eternity before peonies show up to buy. So, if you have tips and/or sources for healthy peonies that stand a chance of growing in central Texas, I’m all ears. I seriously could be “THAT” lady on the block if I could only grow them on my own. LOL! Now, it’s your turn. What knocked your socks off this month? Do share. If you weren’t able to capture the moment in a photo, please feel free to share your moment in words.